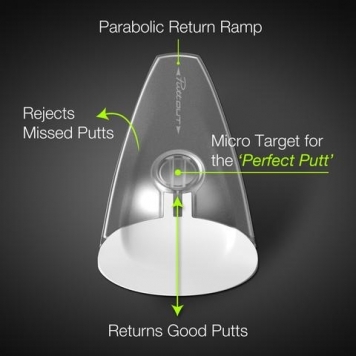 Putt-Out is designed to return putts and reject bad ones. The functional design means when you hit the ball on target too fast the ball will return the same distance it would have gone past the hole if it had missed. If a putt is off line, it rolls off the side. If it’s accurate, the curved gadget sends it back so you don’t need to bend over to pick it up.